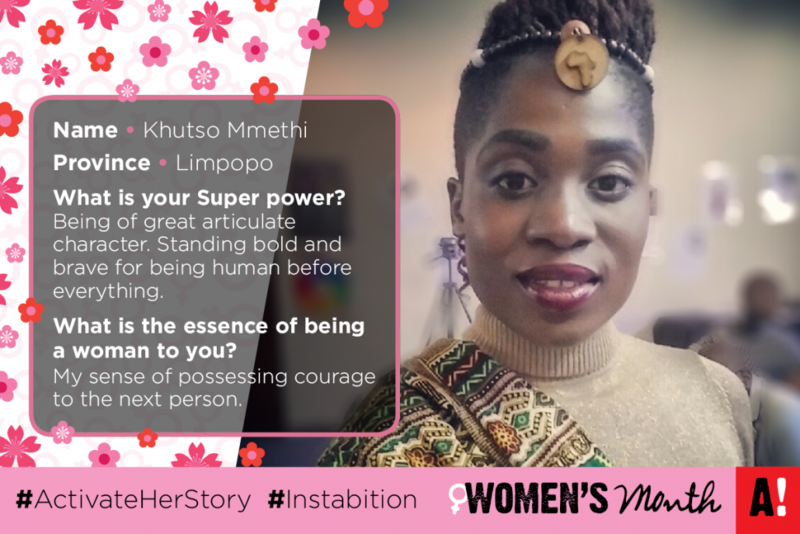 Courage is Khutso Mmethi's Super Power - Activate! Being of great articulate character. Standing bold and brave for being human before everything. Intellect, African, Queen, ambitious, dreamer, lover of life. I do relate to it. It is with great honour to rise and celebrate the struggles, strengths, achievement and success of women. We have been deprived of our freedom for so long. Now we take charge of individuals we are. Society sees women as weak, dependent, confused, not having focus or vision. We are seen to be the feeders of homes, the carers of children and the sitters of homes. I always affirm my character wherever I go. We play a huge role because we see beyond challenges, we see beyond failure, and we have strength to bear whatever change that comes to us. It’s a tough one because I always have to fight to be head. Wow! Peaceful, progressive and eager to achieve more. Be a woman of dignity, be a woman of morals, love yourself and always see the best of you in everything you do.